living up to my name? 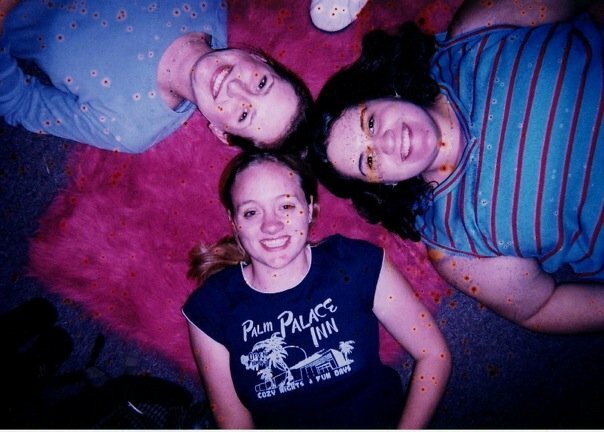 For fun, here’s a picture of me in freshman year of college, with my friends, posing on my roommate’s hot pink faux fur rug. I may not just be Sarah Sweatt anymore, but ever since I went on some serious medicines for my heart defect, I’ve noticed an unpleasant side-effect: lots of sweating. It made for an embarrassing look at my Listen to Your Mother reading, and it seems it isn’t going anywhere. Nothing seems to make me not sweaty, even the most “clinical strength” antiperspirants, which usually work with increasing levels of aluminum. Now, I’m not sure I 100% believe the claims that link aluminum in antiperspirants to things like Alzheimer’s and cancer, but I’m also not 100% comfortable with it, and I’m not entirely comfy with the idea of stopping my body from doing something necessary to keep me cool and excrete things from my body. And since nothing was actually stopping me from sweating anyway, I figured I might as well stop using something useless and potentially harmful anyway. So I’m trying to get off of antiperspirants. I’ve tried once before and was quickly informed by my husband that I smelled like Sasquatch after a few days. Since he’s a person who I’d like to find me attractive, someone I’d like to cuddle up close to me, his opinion about how I smell is pretty much the only one I care about. However, I have done my research this time and know that sometimes, it takes some time for a body to adjust after quitting antiperspirants, much like when I went from washing my hair daily to every few days, when my hair was super oily for a while, as my scalp had been producing extra oil in response to shampoo constantly stripping it away, and eventually it settled down, and now my hair looks better than it ever did when I shampooed every day. So, this time, I’m giving it at least two weeks to see if I can make the transition. It’s been a couple days so far, and while I’m just as sweaty as ever, so far, I don’t think I’m smelly, and my spouse hasn’t complained. I’ve been trying two different natural deodorants that I read a lot of great reviews on, Soapwalla’s Deodorant Cream and Primal Pit Paste. I have been applying twice a day, but that was my norm with antiperspirants, too. Have you ever tried to quit antiperspirants? Am I crazy? Ayurveda thing – please google it). I’m very concerned about anti-perspirants, and I’ve switched to a product called Scent of Samadi. I find it on Amazon. No, you don’t stop sweating, but then scent is heavenly (at least to me!) When the body releases sweat, it’s supposed to happen. You can also try a more cooling diet. I have started sweating a lot more lately and the smell even bothers me! I always was a sweater, but it wasn’t always smelly. Like Loiskubota said I have heard that diet can make a difference, but I haven’t had any luck yet. My husband has also had to tell me that I stink sometimes, totally mortifying! I find the material of my clothing makes a big difference (shirts, pants and underwear), and I love babypowder, but it is not always practical depending on your clothing. I find if you keep other parts of your body cool it helps. Especially my feet. Under my desk I try to keep my shoes or sandals off and I keep a very tiny fan going behind me. Even that small breeze seems to help. And water…drinking lots of water seems to make a difference. I am a very sweaty lady living in Texas (yeah, I know) and since I was pregnant I have been using Deodomom- you can buy it on Amazon, and it’s only made of water and magnesium hydroxide. The label says it’s only good for 3 months and it’s not cheap but oh my, is it life-changing. I had tried ALL the natural ones too. I too have heard that if you go au naturale for a few months, that the body odor smell goes away but after working in Europe for a few summers I can say…..NO. I too have a husband that I’d like to stay married to.